Benjamin was born in Salisbury, Massachusetts on January 17, 1714. He married Ruth True on January 22, 1735. Ruth was the daughter of John and Martha Merrill True. Like Benjamin, Ruth was born and raised in Salisbury and that was where they married and started their family. 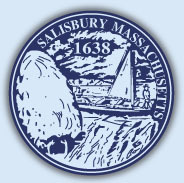 By the time of their marriage in 1735, Salisbury was nearing its 100 year mark. It's boundaries had shrunk from it's initial size and new towns spun off. There was no new land to be had. Men, like Benjamin, began to look to the elsewhere for new opportunities and open land. That land was was to be found in New Hampshire. The Baker's first seem to have moved only slightly north into South Hampton, NH. At least that is what I thought, but then on further research I found that instead of moving to New Hampshire, New Hampshire moved to them. 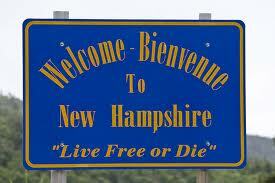 South Hampton New Hampshire was incorporated in 1742 from land that was originally part of Salisbury and Amesbury, MA. This was the result of a long term border dispute between the two colonies that was finally settled in 1741 and the border dipped south into what had been Massachusetts. The family seems to have left South Hampton sometime after the death of their son Benjamin in 1746. 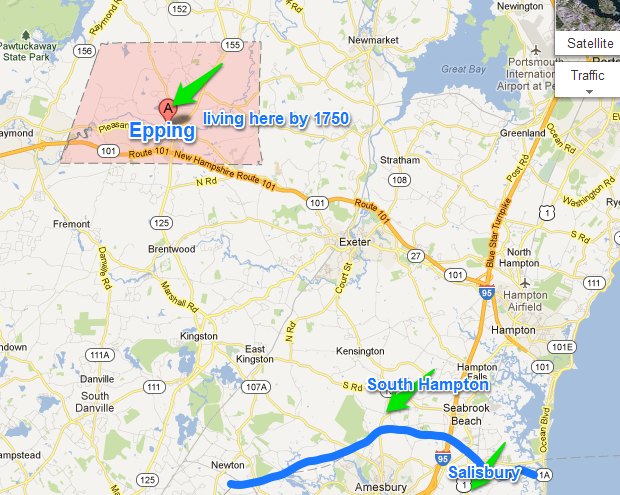 Their next child, another Benjamin, was born in Epping, Rockingham, NH in 1753. In 1750 Benjamin Baker, yeoman of Epping, conveyed land to Samuel Baker of Salisbury. Epping was formed in 1741 from land that was originally part of Exeter. It was named for Epping Forest in England, and at one time the area was heavily forested with lumber being a major industry. There is no date of death recorded for Ruth or Benjamin. In the Rockingham probate records for the year 1788 there is this entry. I believe this is the source of the date of death attributed to Benjamin. I found a probate record for Benjamin Baker of Epping. It was first filed in April of 1776. Benjamin probably died in March or April. At the time of his death his wife's name was Hannah, not Ruth. Below is one of the entries in the probate records. The date is 24 April 1776.